PlayMGM is the online gaming site the MLB platform and broadcast shows will promote. MGM Resorts and Major League Baseball have entered into a multi-year partnership agreement for the United States and Japan. Under terms of the deal, MGM Resorts will become the “Officla Gaming Partner of MLB” and the “Official Entertainment Partner of MLB”. While other US sportsbook operators retain the right to make partnership deals with MLB franchises, MGM Resorts becomes the official sportsbook of the league office. The deal might represent a green light to individual baseball franchises which might be considering sponsorship deals with sportsbooks. Already, three NFL teams — the Dallas Cowboys, Oakland Raiders, and Baltimore Ravens — have signed partnership deals with bookmaker brands. One NHL team, the New Jersey Devils, have done the same. MGM Resorts’ rival Las Vegas operator, Caesars Entertainment, signed those four deals with NFL and NHL clubs. No MLB baseball franchise has signed such a deal. Murren touted another recent corporate partnership with GVC Holdings of the Isle of Man, the GVC Joint Venture (JV). The two companies are working together to build a coast-to-coast live sports betting product for playMGM. MLB’s digital and broadcast platforms — including the MLB Network, MLB.com, and the MLB “At Bat” app — all will promote MGM Resorts heavily. The two also agreed to jointly develop “fan engagement offerings” in the coming years. 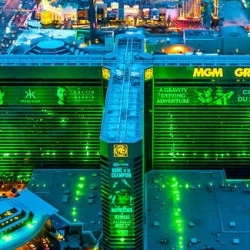 Like MGM’s deal earlier this year with the National Basketball Association, MGM Resorts will use MLB’s official statistics feed for the most accurate digital and live gaming coverage in the business. The statistics deal is non-exclusive. It is a far cry from what Jim Murren or Rob Manfred would have been saying about their counterparts a year ago. Major League Baseball joined the NFL, NBA, NHL, and NCAA to sue Monmouth Park, William Hill US, and the state of New Jersey in October 2014. That lawsuit wound it ways through the US District Court and Appellate Court system, then eventually was heard by the US Supreme Court in December 2017. In May 2018, the Supreme Court rendered its decision: the 46-state PASPA ban on sportsbooks was unconstitutional. Individual states could legalize sportsbooks. Over the years, Rob Manfred was dismissive of sports betting operators, just as MLB commissioners have avoided sports betting in all forms for generations, due to the Black Sox scandal of 1919 and the Pete Rose scandal in the late 1980s and early 1990s. Meanwhile, MGM Resorts fully supported the state of New Jersey in its challenge of PASPA. MGM Resorts owns Borgata in New Jersey and stood to gain from the expansion of gambling in the United States. Since the SCOTUS decision, Borgata installed a sportsbook, while MGM’s Beau Rivage in Biloxi and Gold Strike Casino in Tunica each opened sportsbooks. One might wonder why Jim Murren and MGM Resorts is paying sports leagues for official data when it is readily available through other public services. Besides efficiency and legal considerations, Jim Murren might have wider considerations in mind. After he signed the deal with MLB, reporters asked Murren about “integrity fees” — which the MLB and NBA commissioners are pushing with federal lawmakers the US Congress. Integrity fees are (usually) a 1% fee on gaming revenues that leagues want to reimburse them for the added resources it takes to police the integrity of sports in an age of expanded sports betting. Critics of integrity fees remind the leagues they have claimed to do everything in their power to police the sports for the past several decades, so it should cost them no more now than ever before to ensure integrity. Sportsbook operators and lawmakers alike see them as a naked attempt to collect more cash by the leagues. In other words, MGM Resorts is paying the leagues already, so an integrity fee for the same service is absurd.